At this point I wouldn't be surprised if the Knights of Cybertron are linked to Shockwave and/or Auto-Megatron in the alternate universe. Just makes the scope of IDWverse seem so.. small and unambitious. 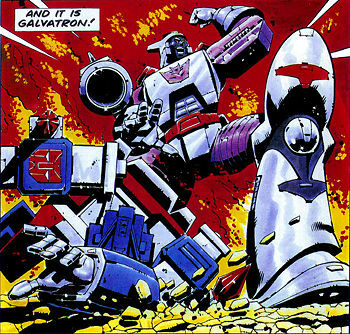 I know throughout his work, Furman had his favourites that always had their time to shine (Galvatron, Grimlock etc). This is another example of that. Shockwave is clearly one of Robert's biggest favourites, obvious since the overly convoluted Shadowplay. ...but Roberts doesn't write op, barber does. ZeroWolf wrote: ...but Roberts doesn't write op, barber does. And? Barber didn't write Shadowplay or Dark Cybertron, of which this entire characterisation of Shockwave is based on. It's certainly not based on Furman's iteration from Spotlight and Maximum Dinobots. Barber and Roberts co-wrote all 12 issues of Dark Cybertron. I think this version of Shockwave is very heavily the Furman/G1 character, with a new wrinkle in his backstory. I would agree that he reads funny now but it's one reason that I hold out hope for the "Shockwave done it" twist really being "Liege Maximo is making it look like Shockwave done it"
snavej wrote: How is it a 'black hole' when it doesn't consume the entire planet? It's something else, like a portal. The use of the wrong term is just IDW 'bigging itself up'. 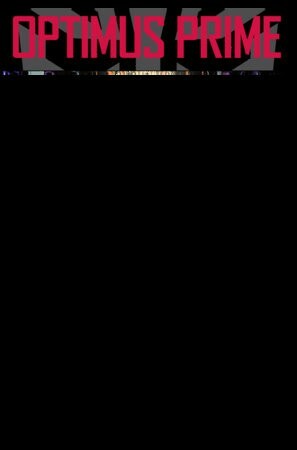 It’s an artificial black hole. It’s not a natural one that doesn’t follow the same physics as a regular black hole. 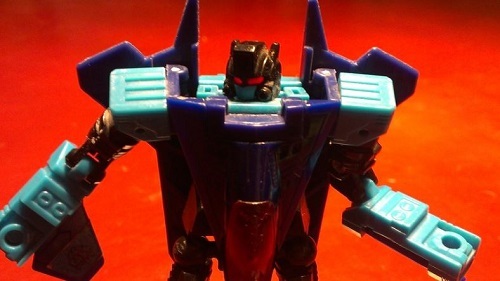 If megaton can use space bride technology to siphon the dark matter of a black hole to power himself up from his eyes than a small stable black hole can exist on Cybertron. It’s also a comic book about giant alien robots fighting where prime once opened the matrix and reformatted an entire planet into a primordial state sooooo yeah. Maybe not try to base it too much in reality. Space brides? Can we order them online?! 'Megaton' should be 'Megatron'. I never really agreed with the MTMTE depiction of that power. Why did he have to siphon antimatter from a black hole when he could get it much more easily from the quantum foam of empty space? It was stupid. If the stories have little basis in reality, fundamental forces would be screwed. There would be true chaos. The stories would become impossible to understand. They wouldn't be very entertaining and would be rather pointless. There has to be considerable basis in reality for the stories to be meaningful. The real problem here is arts graduates failing to grasp science but arrogantly trying to style it out. AllNewSuperRobot wrote: At this point I wouldn't be surprised if the Knights of Cybertron are linked to Shockwave and/or Auto-Megatron in the alternate universe. Just makes the scope of IDWverse seem so.. small and unambitious. 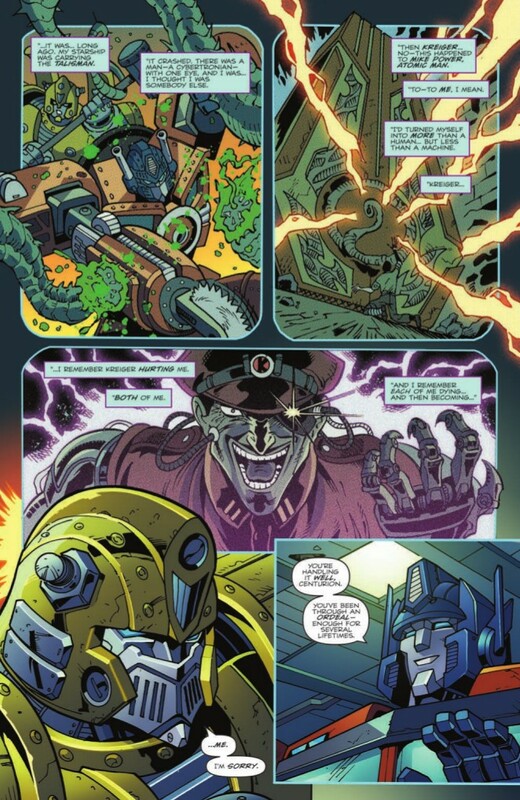 Don't forget the cross-dressing Overlord, who was sent into the past and future in 'Requiem for the Wreckers'! As you do. See, when IDWverse first started it was huge, in scale. The Great War was stretched out across the galaxy. Earth was just one of many fronts it was being waged on. The entire cast was spread out as cells waging a war of attrition on seemingly every planet in this universe. Since then, everyone has more or less been piled back into Earth, Cybertron and the Lost Light. Expansion through the Colony Worlds did overall very little to readdress that, as all of the speaking characters were put on Cybertron anyway. It's just quite sad really, to see all that promise squandered. That's just it. In his (brilliant) Spotlight, he seeded a primitive world with Energon for experimentation. Yet in spite of the awesome act of defeating the entire Dynobots single-handedly, was ultimately caught out by a sneak attack from Grimlock. That to me, just doesn't mesh with This infallible Shockwave, that has been planning unbeatable schemes from the shadows for ages. He went from 'Brainiac' to 'Darkseid'. ...Roberts didn't write requiem, and Roberts didn't write op. This isn't hard to understand. If you want to argue that the characters are being written in the style of another writer's characterisation, then that makes sense but is still silly as the writer will build on the previous work. Also to argue about stories being based on reality is, ultimately, daft. These are stories about giant shape changing robots that just so happen to look bipedal aka humanoid. Reality left at the first possible exit. If the argument was: "Prime defeats unicron with the power of friendship!" Then we could agree that is daft. However arguing about how made up physics would act in a made up work of fiction? That's like arguing that 'A Christmas Carol' is an appalling work of fiction because you believe ghosts don't exist. Or that the lion king is a terrible kids movie because lions can't really talk. The writer's wanted these events to happen, as long as they've gave an explanation in the story (unless it was meant as a humourous moment of craziness) then focus your fire elsewhere. Unless of course the story is depicted as a very realistic tale with no fantastical elements, then fire away. ZeroWolf wrote: ...Roberts didn't write requiem, and Roberts didn't write op. This isn't hard to understand. Who was talking about Requiem? Or op for that matter. I was making an observation about Shockwave, his role within op and his characterisation. ZeroWolf wrote: If you want to argue that the characters are being written in the style of another writer's characterisation, then that makes sense but is still silly as the writer will build on the previous work. Well now it's barbers shockwave as it's him who is writing op. Actually giving Barber's guiding hand on the stories since he joined, I think all all the characters are his to some extent. Likewise I think barber had a big hand in shadowplay for dark cybertron and this arc. This may not be the story we wanted but it's the story they wanted to tell. Also bear in mind, the line defining the suspension of disbelief (especially in Transformers) has always varied wildly from person to person. There are still some who decry Mass Displacement and Insecticon cloning tech, after all these years. Some people will have different intellectual limitations and boundaries others don't within their personal enjoyment of the same fiction. From IDW Publishing, and in lieu of a new comic from their Transformers universe this week, we have a full preview of the third collected volume (in trade paperback) of the ongoing series Optimus Prime, by John Barber and a cast of different artists - as this particular collection also includes the First Strike tie-in two parter originally released as Optimus Prime: First Strike and Transformers: First Strike (both of which can also be found in the Champions TPB). Take a look below, and join the discussion in the Energon Pub discussion thread! What new future will the Transformers bots face? 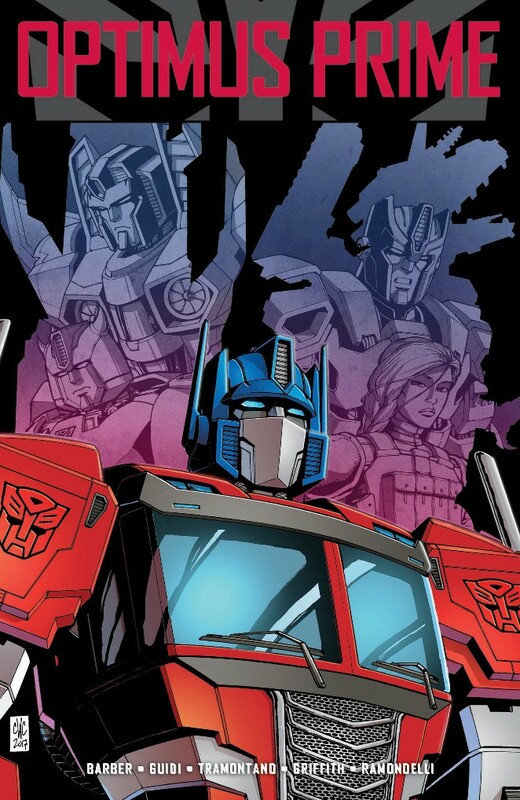 With Optimus Prime trapped on Cybertron, embroiled in the First Strike event, the Autobots on Earth set off on a mission to find their missing friend, Jazz. But anti-Cybertronian humans are after him as well, and they're armed with Cybertronian weapons! Collects Optimus Prime issues #11–14 and the Optimus Prime: First Strike and Transformers: First Strike one-shots. WHEN does this coming out? steve2275 wrote: WHEN does this coming out? This week, if schedule is correct! You probably need to order it from your local comics shop. 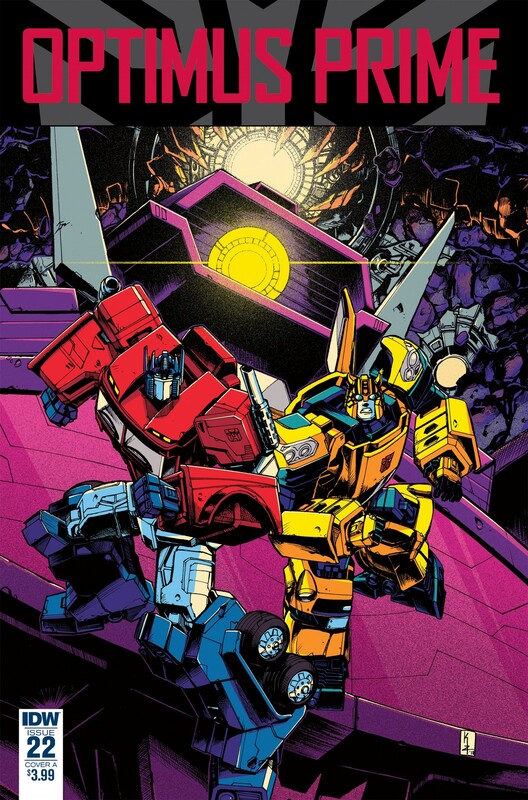 Coming at us via both Previews World and the artist Kei Zama herself, we have a look at the retailer incentive variant cover art for issue #20 in the ongoing Transformers comics series from IDW Publishing Optimus Prime, as it concludes the penultimate story arc The Falling! And as you can see, we're leaning heavily into Onyx Prime's beastly presence, with a fantastic homage to the Beast Wars continuity, featuring Optimus Primal, Megatron, and the Beast Wars II Nemesis ocular planet-ship used in the series so far. 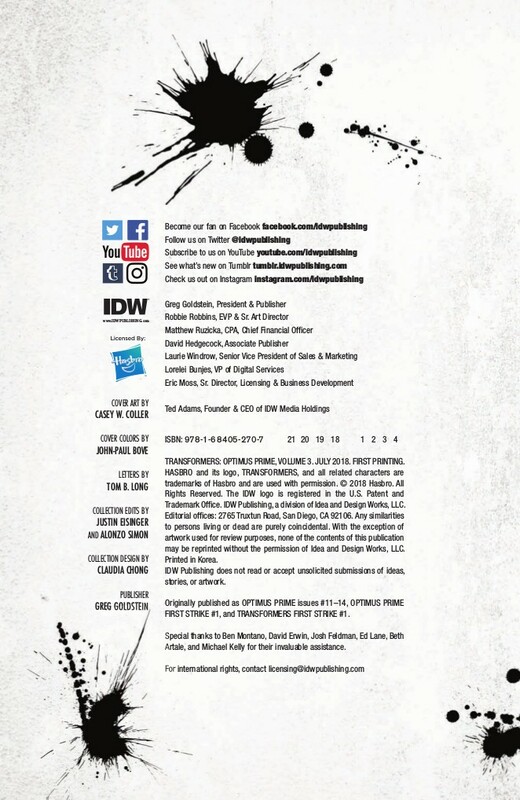 Take a look below, and beware of the ..'spoiler' of sorts in the solicit blurb! "The Falling," Part 5. Optimus Prime has faced defeat before and come back... but he's never seen anything like this. Beyond life, beyond death-only the wisdom of an old friend can save him. Meanwhile, Victorion battles Devastator... and only one will survive. The return of Bumblebee! One shall rise, one shall fall, but who will destroy them all? That's some stellar art there of bw op and megs but do they play any part at all? That cover is freakin' gorgeous! ZeroWolf wrote: That's some stellar art there of bw op and megs but do they play any part at all? Hopefully more than the Spooky Onyx Bodyguards role that they have so far! Don't have a shred of a concrete idea though. Certainly does have me reflecting on how wildly different members of the Beast Wars cast have been handled. Rhinox is ancient, presumably died a long time ago - unless he's Fat Tankor now which would be fine. Rattrap schemes for Prowl. 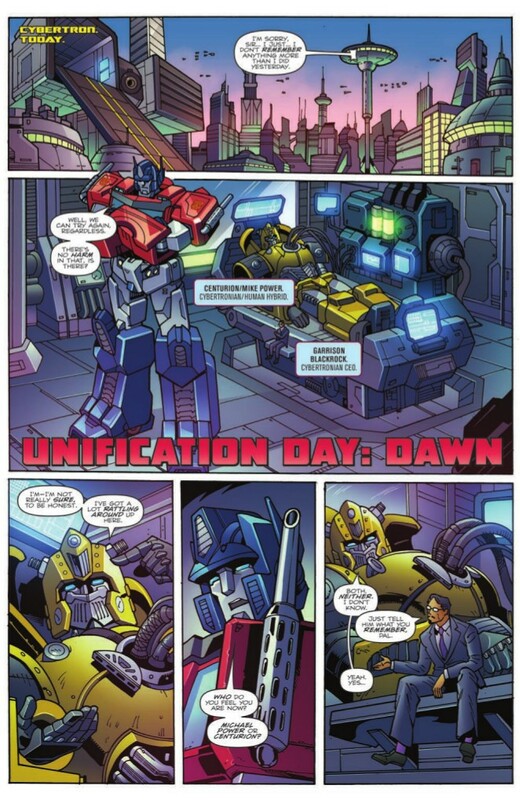 Tigatron and Airazor are on the Council of Worlds. Cheetor and Blackarachnia were introduced but never had their plot or Eukaris' go anywhere and are presumably in Unicron's tummy. Primal, Megatron, and a massive host of others have been in Onyx's entourage. The universe still hates Waspinator, but at least he survived the Visionaries crossover and his temporary Thrustinator reformatting! 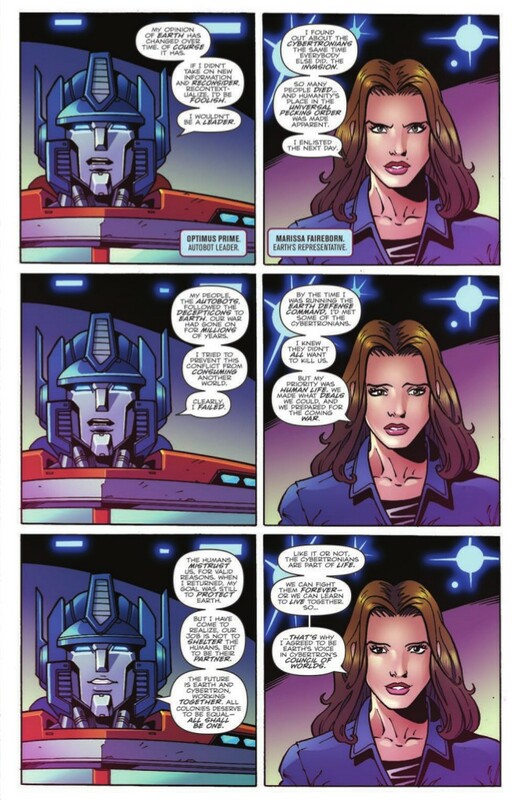 Thanks to a heads up from Podcaster and comic master ScottyP, we have news that the final Trade Paperback for IDW's Optimus Prime series has been listed on the Penguin Random House website. The trade will collect issues 22-25 and the 2018 Annual. 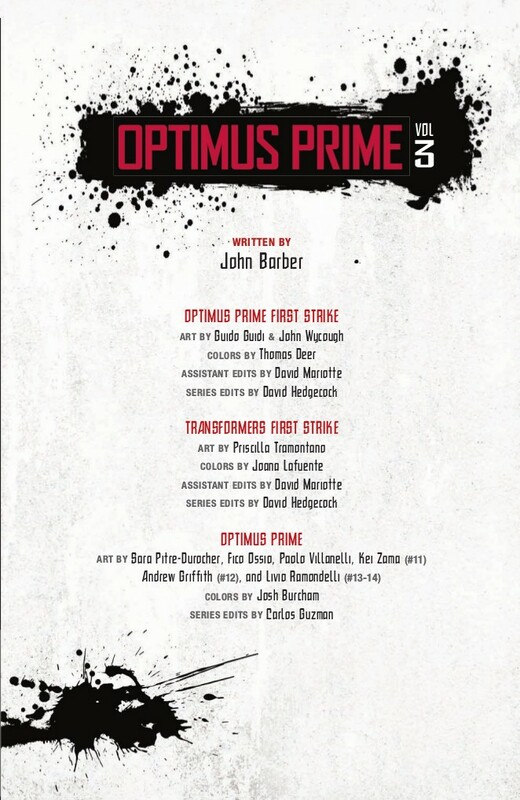 Worthy of note though is that the trade's cover is left mostly blank, with the top Optimus Prime logo visible as well as a thin line of the actual cover, but so far the cover itself is being kept a secret. What are they up to? Check out the listing above as well as the little bit of the cover we see below, and let us know what you think in the comments section below! End of the Road! The Autobots are faced with mutliple threats, one of them a danger not only to Cybertron, but to the whole Universe! 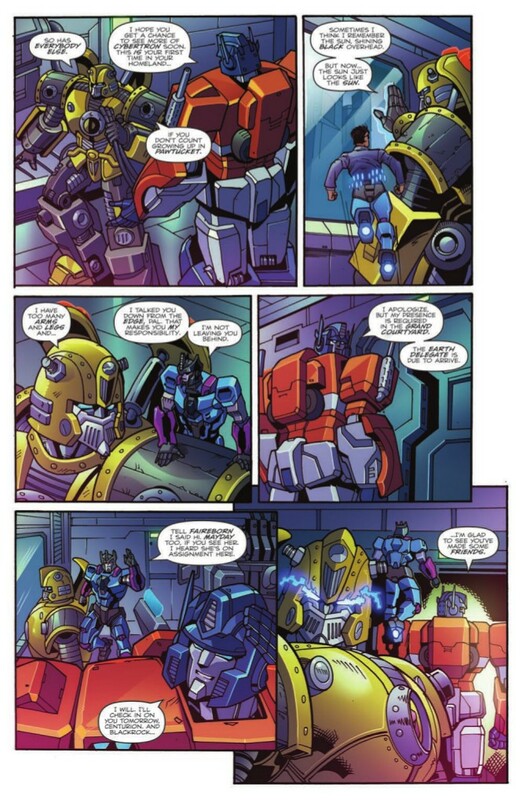 Trapped between Shockwave’s attack and Unicron’s onslaught, Optimus and the Autobots struggle to make sense of what’s left of their world, as Optimus’ colonist soldiers contend with a brutal reality–they have no homes to return to. 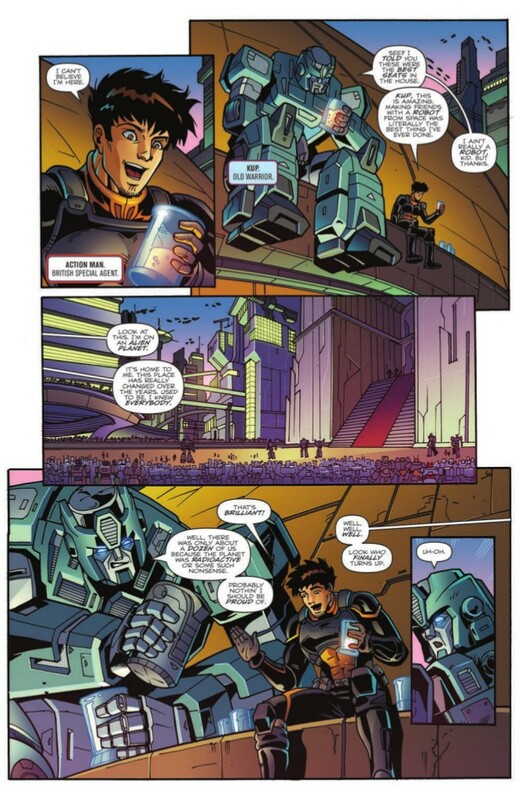 Plus, Shockwave reveals ancient truths–as an old friend tries to reconnect with Cybertron. Collects the 2018 Annual and issues #22-25, which conclude the series. I initially thought it was the OP 19 cover with Shockwave, but the colours of that 'beacon' streak don't match. If we already know the cover then why hide it? william-james88 wrote: If we already know the cover then why hide it? Not everyone follows the solicits or the single issue releases, and may not want the Shockwave and Bumblebee spoiler so many months in advance of the trade release. Some guy at Penguin publishing was probably just following a well-intended note from IDW. 4,456 pages were recently viewed by 848 unique visitors. This page was viewed 1 times on Saturday, April 20th 2019 7:43am CDT. © 2019 Seibertron, Inc. DBA Seibertron.com. All Rights Reserved. Established June 2000. Seibertron.com is owned by Ryan Yzquierdo.